Hooray for American Lululemon fans! The Halsted store in Chicago just announced a warehouse sale for January 27, 28 and 29 from 9am – 9pm at the Donald E. Stephens Convention Center at 5555 North River Road, Rosemont, IL. 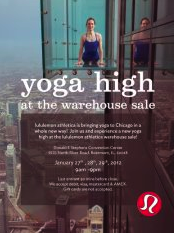 This will be the very first US warehouse sale for Lululemon. "Lululemon ‘The Sea Wheeze’ Half Marathon Ad in February Runners World Maganzine"